Animated GIFs have been around for almost two decades, allowing users to create and share simple animations online. The file format has persevered despite its shortcomings (e.g., no sound), and in fact, it’s recently seen a resurgence in popularity. People have taken to converting short, often comical video clips into animated GIFs, which they then post to blogs and social networking sites. 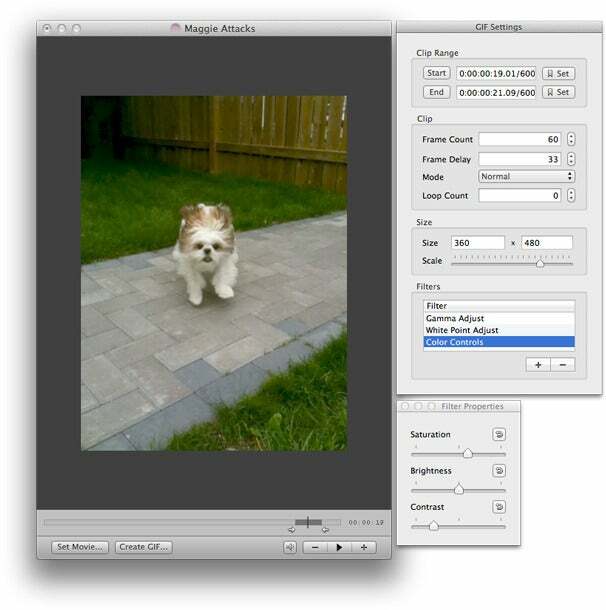 There are a number of ways to create video GIFs using your Mac, including uploading a video clip to Gifninja.com or manually assembling an animation using Adobe Photoshop. However, the most efficient way to create a video GIF is with Patrick Roger’s GIFBrewery ($3, Mac App Store), which I'll use to demo the concept. Apps such as Total Video2Gif ($5, Mac App Store) can tackle the job as well, but with less finesse than GIFBrewery. • Choose a clip that’s comical, cute, or topical. • The clip should be short (2-5 seconds) in order to keep the file size reasonable. • The clip should be primarily visual, as the resulting animation will have no sound. GIFBrewery only supports video files that can be played by Apple's QuickTime software. However, you can expand the number of playable video formats by installing free QuickTime plug-ins onto your Mac, such as Perian and Flip4Mac WMV. GIFBrewery streamlines the process of creating a video GIF, but it’s not as simple as clicking a button. Open GIFBrewery and drag your video file into the empty video window to get started (or choose File -> Open from the main menu). Set the Clip Range. Immediately below the video window, you’ll see a video scrubber with arrows. These arrows define the portion of the video to be converted. Move the scrubber control (the thin black line) to the start of the segment you want to convert and choose GIF -> Set Current Frame as Start of GIF, and then repeat this process for the end, choosing GIF -> Set Current Frame as End of GIF. If you need to fine-tune the frame, you can also use the arrow keys on your keyboard to make finer adjustments. Now turn your attention to the GIF Settings window. Under Clip Range, you’ll see the exact timing for the start and end (down to the millisecond). I recommend you tweak the start and end times to match full second intervals as closely as you can; for example, change a start time of 03:18 to 03:00. Unfortunately, GIFBrewery does not allow you to directly edit the timing numbers, so you’ll need to tug the arrow controls in the scrubber to adjust these times. Set the frame count and frame delay. Under Clip, you’ll see settings for Frame Count (the total number of frames) and the Frame Delay (how long a single frame is displayed). These are the toughest figures to sort out. The optimal frame count depends on a number of factors, including the duration of the video and the frame rate of the video. (You can find out the frame rate of your video by opening it in QuickTime Player and choosing Window -> Show Movie Inspector.) Let’s say the frame rate is 24fps and you have chosen a segment that’s three seconds long. In this scenario, the ideal frame count is 72 (24 x 3). Alternatively, you can count the frames manually. Place the scrubber at the start of the segment you want to convert and then, using the right arrow key on your keyboard, count the total number of frames. The Mode option allows you to generate the clip three different ways: Normal, Reverse, and Palindrome (forward and backward), with all three options looping endlessly. In most cases, you’ll leave this setting as Normal. A fourth option, Loop Count, allows you to control how many times the GIF repeats (in case you don't want it repeating endlessly). Creating a video GIF with fluid motion requires carefully choosing the Frame Count and Frame Delay. Set the size. Most video files these days have quite large pixel dimensions, measuring at least 640 by 480. That’s just fine for a proper video file, but too demanding for a GIF. (At that size it’s very likely to play slowly and have an excessively large file size.) Start with a size of 160 by 120 and then experiment with larger sizes, if you feel you must. Add a Filter (Optional). GIFBrewery allows you to add filters to brighten, color-correct, or stylize your video GIF. For example, you might want to add a gamma filter to brighten up a dark video. Create your GIF. After you’ve configured all the settings, simply click Create GIF at the bottom of the video window. The app will then generate the animation and preview it for you. Note that the preview may display slowly if you’ve chosen a high frame rate, but it should play fine in a Web browser. To complete the process, click Save. Finished looping animated GIF, starring Maggie. Video GIFs can be a lot of fun, and you’ll certainly want to share them online with your friends and family. The only caveat is that the speed of the animation is dependent upon the app used to view it. Many Mac apps clamp the maximum speed of animated GIFs at 10 frames per second, and as a result, animations with higher frame rates will play somewhat slowly in apps like iChat and Mail. The optimal viewer for video GIFs is definitely your Web browser (Safari 5.0 or better), so it’s best to share them via your blog, personal Website, or Google+.